Silver Uberhaul: The replating is done in conjunction with your Uberhaul. It includes all of the same goodness of the Uberhaul, and it will look better than ever with a satin silver finish and gold wash in the bell. Technician’s Re-plate Special: We return the instrument to you re-plated and with Uberhaul-quality work done through the dry fitting. This means that all the dents will be removed, the keys fit, tone holes leveled, re-engraving, you name it. Everything included in a regular Uberhaul, except you install the pads, springs, and materials, and set-up the horn yourself. Let us do the hard part and you can get the credit. Who would benefit from silver plating? Why Are Our Re-plates So Good? In the band instrument repair industry, it is normal to repair saxophones mechanically, and then they are buffed until shiny. Buffing can be a damaging process, and it can undo some of the work that the technician just did. In these cases, it will look fantastic once plated, but is mechanically out-of-whack. Technicians in high-volume shops don’t always have much choice in the manner, as many need to do the process quickly in order to keep up with work load and keep prices lower. 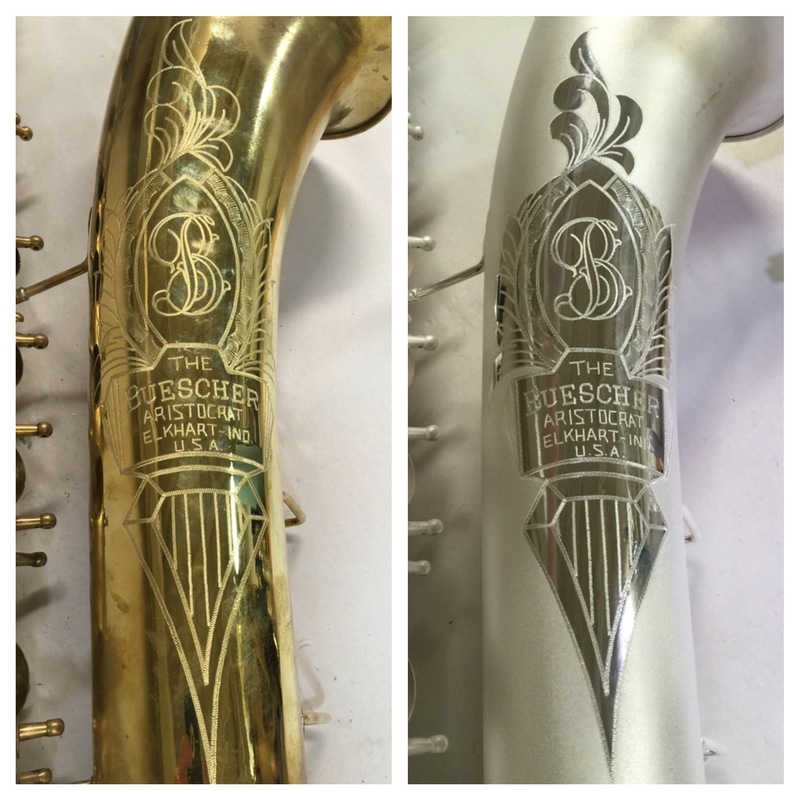 The advantage of the Sax ProShop is that since we complete our work assembly line style, we were able to fully integrate the plating process in with the Uberhaul. The end result after much research and hard work is that every single step along the way has been carefully considered in relation to what happens before and after. Because the process of buffing is damaging, we have made the decision that we only offer satin finish which doesn’t remove any metal. A select few spots, such as the engraved area, the insides of the bell, and body bands will be polished and then masked off before the satin finish is applied. The satin finish makes the select bright highlights and engraving stand out and shine. Once all of the body work and key work has been completed in the Uberhaul process, the bright highlights are polished and the bell is re-engraved. Next, the engraving and smooth highlights are masked and the body is given a classic satin finish with our proprietary blend of media. The media does not remove metal from the body: it simply changes the surface of it. At this point, the tone holes are leveled and the instrument is cleaned and ready for plating. With every single bit of work done carefully and meticulously already, the ONLY thing that happens at the plater is the actual application of silver to the keys, neck, and body. Everything comes back fitting exactly as it did when it was sent out, and the Uberhaul process continues as usual. Our unique and proprietary refinishing service extends the life of an instrument and makes it a work of art, so at the end of your Uberhaul, your saxophone looks just as good as it sounds.